I’m thrilled to say that I received a direct message on my Twitter account (@psdlund) the other day from Frederic Brussat regarding these small group ministry session I’ve been putting together using material from Frederic and Mary Ann Brussat’s website spiritualityandpractice.com. He said he was “thrilled & honored by your small group ministry sessions organized around our…practices. They are helpful, accessible & elegant!” As I said, I’m the one who’s thrilled by this. And I’m honored to say Frederic has given me permission to go ahead and create more of these sessions based on their Spiritual Rx practices they’ve developed. My goal is to add a new one each Sunday. So, without further ado, here’s the first: Attention (because they’re, you know, in alphabetical order). In this volume of his lectures, Henri J. M. Nouwen shares his reflections on four clown-like elements in the spiritual life. In this passage the author exhorts us to pay close attention to the natural world. “Our difficult and very urgent task is to accept the truth that nature is not primarily a property to be possessed, but a gift to be received with admiration and gratitude. Only when we make a deep bow to the rivers, oceans, hills, and mountains that offer us a home, only then can they become transparent and reveal to us their real meaning. Questions: Share a story about a time when paying attention enriched your understanding of a relationship, an event, or the natural world. Group Session Plan based on resources on Attention from www.spiritualityandpractice.com. For a PDF version of this small group ministry session, click here: Attention. Last week I posted a list of ways congregations can use digital media and web technologies to enhance their faith formation offerings. I believe there were roughly eleventy-twelve items on the list, which makes it a bit unwieldy. Fortunately, those fine folks at Faith Formation 2020 have come up with a handy-dandy visualization to help us wrap our heads around the relationship between physical places and virtual spaces when it comes to faith formation. The first approach begins with people’s participation in face-to-face learning activities (small group, large group, whole church, community/world) and then uses virtual online spaces with learning activities, print/audio/video resources, and social networking to extend, deepen, and support the learning that began in the physical program. 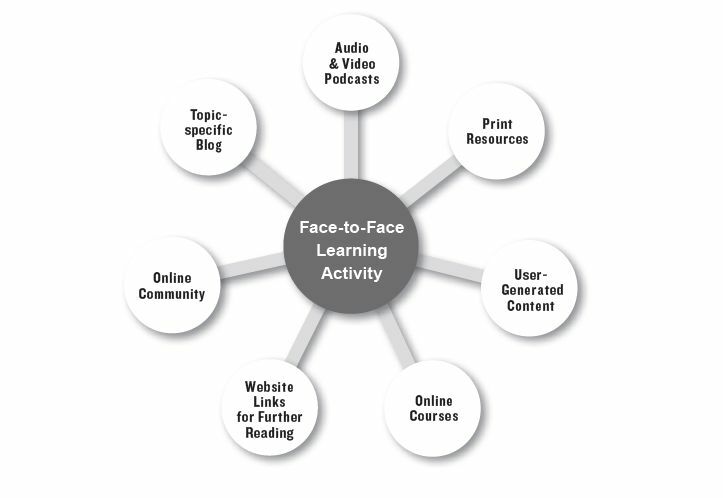 The second approach begins with people’s involvement in online/digital learning activities and leads them to participate in face-to-face learning activities. From what I understand of online learning, this strategy of face-to-face supplemented with online/digital activities and online/digital activities leading to face-to-face encounters is a real winner. And when you break those online/digital resources into the seven areas listed in the chart above (audio/video podcast, print resources, user-generated content, online courses, website links for further reading, online community, and topic-specific blog), a seemingly daunting task becomes somewhat easier. The goal is to use the church’s website as a online spiritual development/faith formation center with a variety of existing resources. One example: the International Council of Unitarians and Universalists (ICUU) has been offering a monthly “Global Chalice Lighting” on their website since September of 2003. I could imagine a spiritual practice page on a congregation’s website offering a place for visitors to light a virtual chalice and reflect on that month’s chalice lighting words. (You can experience just how thoughtful an online spiritual experience like this can be at www.gratefulness.org.) Other online resources include the Tapestry of Faith curricula series, the complete texts of all the current UUA pamphlets, and the Worship Web. May the quality of our lives be our benediction, and a blessing to all whom we touch. Here’s the last of the five small group ministry sessions I designed to counteract the deleterious effects of consumerism. The first four were Hope, Hospitality, Forgiveness, and Gratitude. This week’s session is on Compassion. It is said that a long time ago, a Mahayana Buddhist master was teaching about Bodhicitta in ancient India, when his words were interrupted by the barking of a dog. The loud insistent barking so annoyed one man in the crowd that he threw a rock at the dog, striking him on the left side. At that instant, the master fell to the ground and cried out in pain. Later, when his worried disciples asked what had happened, they saw that on the teacher’s left side there was a large bruise. The dog’s pain had so touched this teacher’s noble and tender heart that it became his pain. He took it on himself. Questions: Tell a story about a moral mentor you have known—someone who inspired you with his or her compassionate activity. If you see on the evening news a person who moves you by his distress, just breathe it in and breathe out to him love and strength. To Practice This Thought: Send love to a stranger you notice is in need. Group Session Plan based on resources on Compassion from www.spiritualityandpractice.com. For a PDF version of this small group ministry session, click here: Compassion.